Keeping in mind the vast necessities of the patrons, we are engaged in providing a wide range of Soan Papdi. 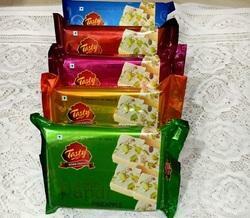 To meet the various requirements of the customers, we are involved in offering a wide assortment of Soan Papdi. Fostered with in-depth knowledge in this domain, we are actively betrothed in offering a superb quality gamut of Flavored Soan Papdi. Sugar, Refined Peanut Oil, Chick Pea Flour, Wheat Flour, Cardamom, Almonds & Pistachios. Sugar, Peanut Oil, Hydrogenated Vegetable Fat, Bengal Gram Flour, Wheat Flour, Cardamom, Pistachio and Almond. 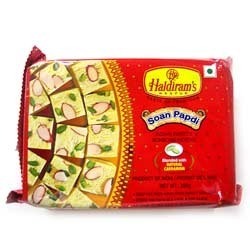 To supply the ever rising needs of our customers, we are occupied in offering a wide range of Sohan Papdi. Kanha - Sanwaria Sweets Pvt. Ltd.
Soan papdi is a popular North Indian dessert. It is usually cube-shaped or served as flakes, and has a crisp and flaky texture. Its main ingredients are sugar, gram flour derived from chick peas, flour, ghee, milk, and cardamom. We are a unique name in the market to provide our honourable customers an exclusive range of Soan Papdi. We have engraved a prominent place for ourselves in this domain by providing a premium quality collection of Sohan Halwa. - Bhagat Fig & Nut Bars Bhagat (Heera) Dry Fruit Chicki.